Duet Wifi+Duex5 + 5way Diamond + Cura = Need help to finetune config. I've been configuring my Duet WiFi + Duex5 to use the new 5way Diamond Hotend + continue to use Cura as I like it best. I had it working in regards to printing with just 1 color at a time and everything was fine, but in order to use the Diamond properly I needed to use Firmware Retract - As I understand it, I need to enable Volumetric printing in order to use Firmware Retract in Cura. Is this true/false? Now, in order to use Firmware Retraction in Cura, I need to either pick the UltiCode or RepRap (Volumetric) gcode flavor. Since Ulticode is no good for us, I am now using RepRap (Volumetric) in Cura. Diameter of filament is set in Cura. I can see no place to setup anything related to Volumetric though aside from Gcode flavor. Problem is that it now extrudes what looks like 3-4 times the normal amount of plastic when printing and I just can't seem to solve this. My Cura startup code at the end of this post. I've previsouly had this very problem, except it was like 10times plastic, which I solved by uncommenting the M83 in the config.g - I have tried playing with M83 and M82 in both the Config.g and in Cura startup.gcode, but I just cannot find a combination to make it work! G31 P25 X-30 Y-5 Z1.5 ; Set BLTouch z probe trigger value, offset and trigger height. M569 P2 S0 ; Drive 2 goes forwards Z-both motor on 1 driver for now. I have tried playing with M83 and M82 in combinations with the same in config.g with no success. This here is how it looked when it worked before I changed to RepRap (Volumetric) gcode flavor. First, a plea to everyone who uses Cura. Please nag the developers to add support for relative extrusion coordinates. Absolute extrusion coordinates makes no sense at all and supporting them wastes inordinate amounts of my time because of the complications they bring to implementing features such as pause/resume, resume on power fail, and mixing extruders. 2. I don't know whether or not you need to set volumetric extrusion in Cura to use firmware retraction. 3. Volumetric extrusion is not supported in stable firmware 1.18 but is supported in the 1.19 release candidate. It is enabled by an M200 command to set the filament diameter. I don't know whether or not Cura generates this in the prologue automatically. Thanks, I'll play around and test it. I guess it's nr3 that goes wrong as I've set Cura to RepRap (Volumetric) as I had to do this to make it do firmware retract (not confirmed this yet). Since I run 1.18 the firmware and cura is at a mismatch. Edit: just checked my backup startcode and I can see I normally use M82 I've edited the first post. Ok, so the M200 I'm using now to enable this, does not work unless I update firmware to 1.19? In cura we define filament diameter and it runs in Volumetric if we choose RepRap (Volumetric) GCode Flavor in Machine Settings. I read it only uses the G10 and G11 for firmware retract when using this setting or ulticode, but havn't tested it. There is a workaround for firmwares that don't support volumetric extrusion, which is to set the filament diameter in the slicer to 1.128mm. But I'd prefer you to try 1.19RC3. That's interesting, but I finally managed to get the EDGE firmware and such up and running, so new testing commecing. I didn't know I had to copy over the files on SD, so just did the web upgrade path - Can we expect to update/upgrade via web from now on? (I know this is out of topic). I found that we can. Copied over the files, renamed and extracted as pr your instructions. I had problems as I couldn't connect to neither WDC or USB… but my PanelDue connected fine, and printer reacted as it would with normal firmware, so I made a macro to upgrade firmware and it actually worked. Also used the setnetwork macro you explained. I still could not connect to neither WDC or USB though untill I typed in M550 S0 and M550 S1 in the display.. in hindsight I guess the setnetwork macro only setups the parameters but does not enable the wifi. Maybe this detail should be listed in the upgrade instructions? For some reason I still can't connect using usb.. in fact the printer acts weird when doing so - my LED turns off, which are enabled using Gcodes on my Duex5. Worked fine before this - been a while since I tested it tough… lucky I had a PanelDue! Hmm, after updating firmware, my X axis moves when I Press Y and the other way around? I've changed nothing in my config and it worked before. If you were using 1.17 or earlier series firmware or 1.18 firmware (not 1.18.1 or 1.18.2) and a Windows operating system, then to get USB working you need to install a newer version of the Windows device driver from https://github.com/dc42/RepRapFirmware/tree/dev/Driver. Re the X and Y issue, read the upgrade notes at https://github.com/dc42/RepRapFirmware/blob/dev/WHATS_NEW.md. The drivers thing should really be noted in the upgrade info I just used the latest stable firmware before this, but I havn't used USB since I first got the board up and running, so hard to know. I have looked in and tried to find anything relevant the notes.. but I havn't been able to find anything in there… got a search string so I can find the relevant info? edit: I can connect now, after driver update, but printer acts odd still - led blinking. Ok, I found the note, but I don't know what to do about it. Important! On a CoreXY machine, if upgrading from a version prior to 1.19beta9, you need to reverse the Y motor direction. Similarly for CoreXZ and CoreXYU machines. If I change M560 P1 and P2 from S1 to S0 they just go the other way, but they X is still moving when Y should move, and the other way. Ok, figured out I needed to jus reverse Y motor. Please consider when you help people, which you do very fast, don't just link and say "look in this document".. I'll bet most users in here allready did that, but were unable to find anything they thought relevant..
3. There may be something else in the upgrade notes that matters in your configuration, so by making you read them I may have saved you some time. I honestly couldn't find the notes at first, but now I know where they are. Problem is not finding the source for info.. most people have read it several times and tried solving a problem for days before asking for help. The problem is understanding what's in the source. Explaining how something works on component level and then expect people to figure out Gcode commands to match it, goes way above most people's capabilities. When people specifically say they have read the relevant sources then linking to them again is rather rude.. as it's a non-answer. Same when people say "use Google"
Edit: at least tell them what to look for. In several posts I've written that I have read the page several times and couldn't figure it out… giving me link to same page without any form of help is demeaning - might as well tell me you think I'm rather dumb. Sure, in the ideal world everyone read all release notes. In the ideal world people also understood what was written in them. In the real world however I would recommend doing like Synology does and split release notes into Important notes and Fixed issues. If changes to Firmware updating method or other important system changes (motors now go in reverse) takes place, they should be under Important notes. Yes, I understand that, but reading the Release notes is a real chore as most of it is gibberish to me. I skim the notes, which is more than most I guess. I've always just updated firmware and then go through and look at the GUI to see changes. I always only use Stable, but this time I had to use RC in order to get Volumetric support. Duet only just supported Volumetric extrusion in 1.19RC/Beta, so you need to upgrade firmware if you havn't allready. Now it actually all works Extruding manually using web interface after enabling Volumetric extrusion via M200 now extrudes only 4/10 though.. guess it’s to consider a firmware bug. 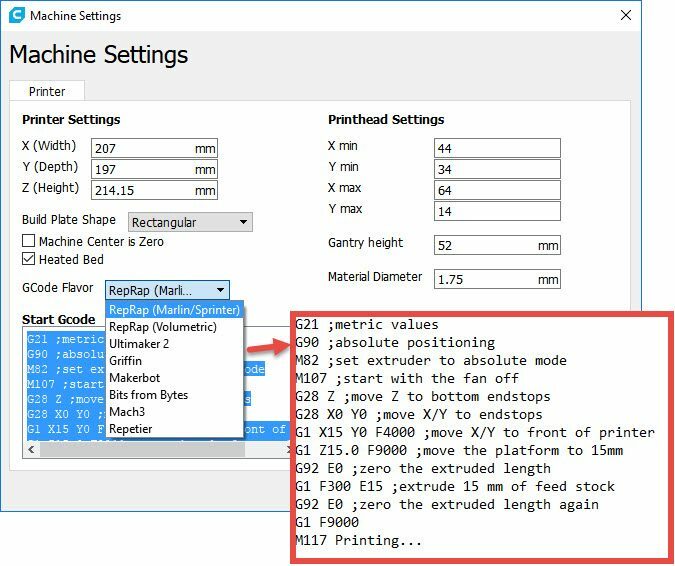 Cura - Use RepRap (Volumetric) Gcode Flavor in machine settings - to support Firmware Retract. Duet Config.g - Enable Firmware Retract using M207 S1.5 F3000 - Diamond hotend retract at 1.5mm is good. 1. Using M82 in the Cura start gcode is sufficient to make absolute extrusion work. 2. In RC5 I've changed volumetric extrusion to work on a per-input basis. This means that you will need to put the M200 command in your Cura start gcode, because Cura doesn't generate it even when it is set to volumetric extrusion. But Volumetric works now using RC3. I print just fine now after the changes made as described. Am a bit confused as to what you are saying. When having configured duet to Volumetric it extrudes 4/10 amount only, when using webinterface? If I comment out the M200 line it works fine, untill I put it back… Seems the Webinterface does not support Volumetric printing? Current startupcode - disregard the drop-down selection as I am using RepRap(Volumetric). Have you tried RC5, and put the M200 command in the slicer start gcode and nowhere else? I find it surprising that Cura doesn't add the M200 command itself.